Should Election Day be a holiday? Maybe. 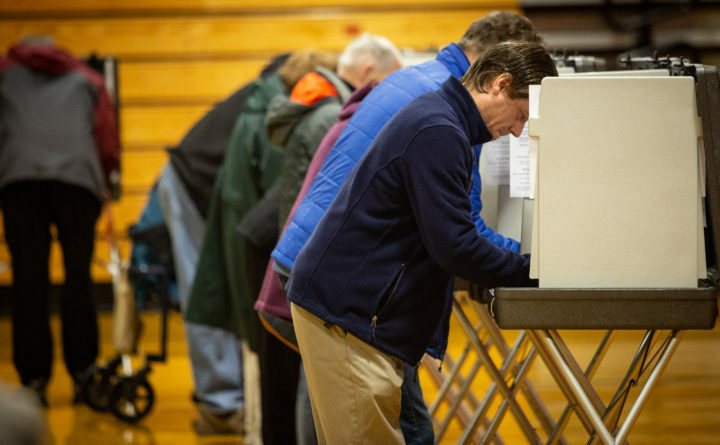 Voters cast their ballots in Gorham on Nov. 6, 2018. Maine has a tradition of high voter turnout, but it is still far from full participation. In November, 60 percent of voting-age Mainers cast a ballot, ranking the state sixth in voter participation, according to the United States Elections Project. Encouraging more voters to cast a ballot is a good thing. Unfortunately, it has become a partisan issue. Low turnout elections tend to favor Republicans. As a result, the party has worked to suppress turnout, especially among young people and minorities, and fought efforts to get more Americans to vote. So, it is no surprise that Senate Majority Leader Mitch McConnell mocked a proposal to turn Election Day in November into a national holiday for federal workers. He called it a “power grab” by Democrats. The far-reaching bill McConnell criticized, HR 1, seeks to do far more than create a national holiday for voting. The Democrat-backed bill would also require presidential and vice-presidential candidates to release their tax returns, compel states to adopt independent redistricting commissions, prohibit purging of voter rolls and create a matching system for small-dollar donations to congressional campaigns along with require more disclosure of political donations, among other changes. Rep. Benjamin Collings, D-Portland, has introduced legislation to make Election Day in November a state holiday. All non-essential state offices would be closed under LD 431. We don’t know if a national or state holiday is the answer, but we do know that increasing voter participation is a worthy endeavor. Maine has already done a lot. Mainers restored same-day voter registration after the Republican-controlled Legislature did away with it in 2011. Early voting, by absentee ballot, is prevalent. Lawmakers have rejected voter ID requirements. Still, there are numerous options for lawmakers to consider, including weekend voting and mail-in ballots, to increase voter participation. In November, only 50 percent of America’s voting age population went to the polls. This puts the U.S. well behind most of its economically developed peers. In their most recent national elections in 2014, Belgium had the highest voting rate — 87.2 percent — followed by Sweden and South Korea with 83 percent and 78 percent, respectively, according to the Pew Research Center. Belgium is one of 24 countries that has a compulsory voter law. These laws are not strictly enforced and fines for not voting are low ($15 in U.S. dollars in Australia, for example), but they tend to increase turnout. In addition to encouraging more people to vote, compulsory voting also brings out a more diverse group of people. Compulsory voting wouldn’t go over well in this country. So, how about weekend voting? Two years ago, U.S. senators, including Angus King, have sponsored a bill to move federal elections to weekends in hopes of increasing turnout. Without work obligations, voting on weekends can be easier. Mark Franklin, a professor at Trinity College in Connecticut reported that weekend voting could increase participation by up to 7 percent. Our longstanding practice of holding federal and many statewide elections on the first Tuesday after the first Monday of the month dates to the mid-1800s. Back then, when it could take a day by horse and carriage to get to the county seat to vote, the concern was making sure elections didn’t interfere with farming. Tuesday was chosen because that day didn’t interfere with the sabbath or market days, says Why Tuesday? a group working to draw attention to America’s low voter turnout and ways to improve it. Perhaps it’s time for a change. France’s May 2017 election for prime minister was held on a Sunday. Turnout was 68 percent. Three states, Colorado, Oregon and Washington, conduct elections entirely by mail. For November’s midterm elections, Colorado’s turnout was 63 percent, Oregon’s was 61 percent and Washington saw 59 percent voter turnout, all well above the national average. Increasing voter participation is a worthy goal, and there are many avenues to explore. Political inertia and self-interest — not a lack of ideas and potential fixes — have been impeding this debate. It’s time for a real conversation about ways to get more Americans to participate in our most fundamental democratic process.